The Ontario SK-5 Blackbird was designed by Paul Sheiter. In describing the knife he states, "I believe the more complicated a product becomes, the more likely it is to fail when your life depends on it. For this reason I designed The Blackbird SK-5 Knife to achieve maximum function delivered through pure simplicity. The blade is made from American made 154CM steel, known for its superior toughness, edge-retaining ability, sharpness and corrosion resistance. The SK-5's blade is 0.13 inch thick and features a full-taper grind. 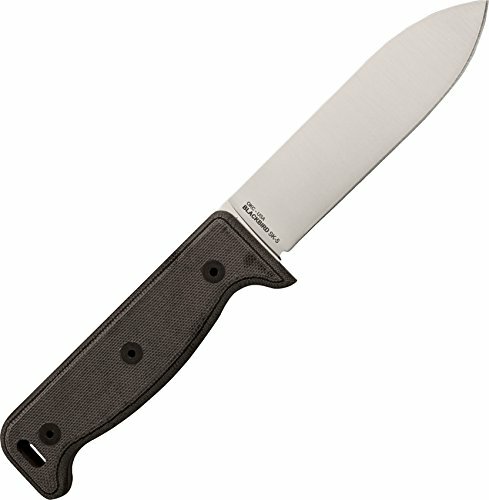 The perimeter of the Micarta handle is rounded to provide a comfortable grip. The handle is secured to the knife tang with stainless steel Allen screws. The Blackbird SK-5 comes with a MOLLE compatible sheath with belt loop that features a rigid protective insert.